Yemen’s war and the ensuing economic collapse has left 15.9 million people, 53 percent of the population, facing “severe acute food insecurity” and famine was a danger if immediate action was not taken, a survey said on Saturday. The report was released as the United Nations brought Yemen’s warring sides together for the first peace talks in two years. Humanitarian groups say peace is the only way of ending the world’s largest humanitarian crisis. While war was the main cause of the hunger crisis, it was exacerbated by extremely high food prices, a liquidity crisis, disrupted livelihoods, and high levels of unemployment, the report said, adding food aid was not enough to plug the gap. “Immediate responses are required to save lives and livelihoods of millions not to slide to the next worse case which is famine,” it said. The survey was conducted by Yemeni officials and international experts according to the international IPC system, which uses a five point scale where 3 is “crisis”, 4 is “emergency” and 5 is “catastrophe” and possibly famine. The release of the report, which is based on a survey completed in October, was delayed several times without explanation and is planned to be updated in March. It showed many pockets of extreme hunger across Yemen, concentrated in areas with active fighting, and especially affecting the 3 million displaced people, their host families, landless wage laborers and other marginalized groups. 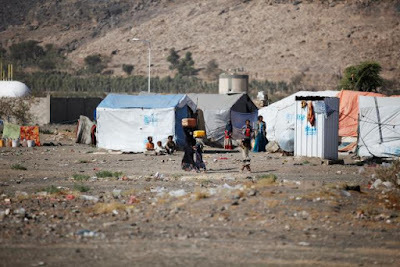 The governorates of Hodeidah, Amanat Al Asimah, Dhamar, Hajjah, Ibb and Taiz each had more than one million people in a crisis situation or worse, and without humanitarian aid 13 governorates would be in a food catastrophe, the survey showed. The 15.9 million people in phases 3-5 could hit 20.1 million people, 67 percent of the population, if there is not adequate food aid. The number in “catastrophe” would triple to 238,000. Some of the figures were released by the U.N. on Thursday.